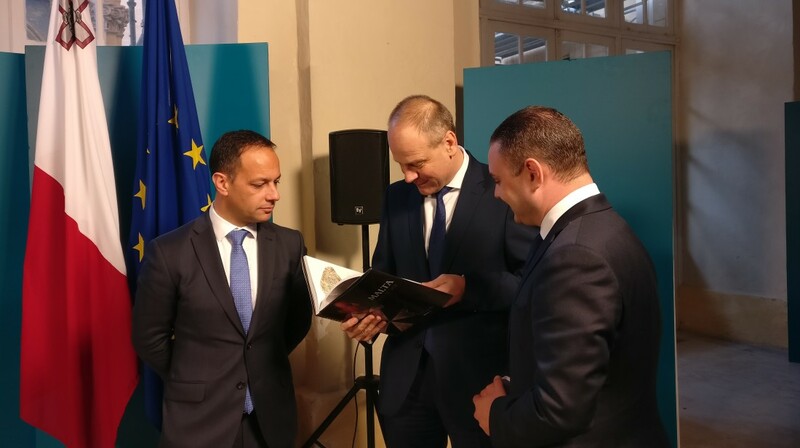 Valletta 2018 Chairman Jason Micallef, and Minister for Justice, Culture and Local Government present Commissioner Navracsics with a small token during his visit to Valletta. European Commissioner for Education, Culture, Youth and Sports, Tibor Navracsics, was impressed after visiting two main Valletta 2018 projects namely MUŻA, the new museum for arts and the Valletta Design Cluster in the lower part of Valletta. Giving his stamp of approval, Commissioner Navracsics said Malta is strongly contributing to building the future of Europe. This is being achieved, he added, through strong investment and the cultural and creative industries. He promised to return next year and experience Valletta during the title year of European Capital of Culture.